Progress can sometimes be expressed in how the public sector invests in cultural education, through the use of high aesthetics as a key element surrounding children from a very early age. 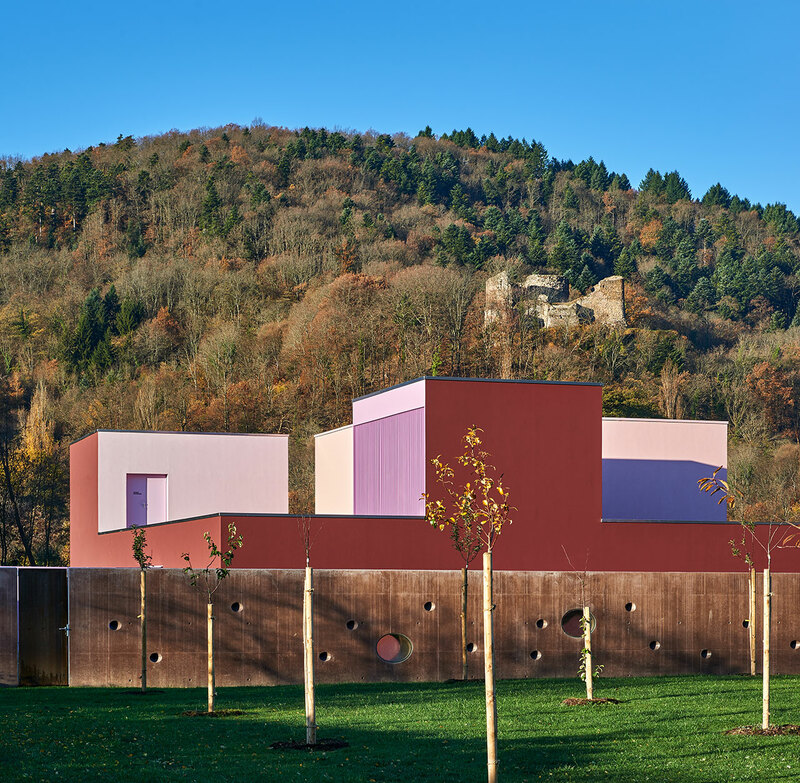 Such is the case of the Guebwiller Region Community, the Municipality Federation that commissioned architect Dominique Coulon and his associates to build a day nursery for the children of Buhl, a small village nestled in a valley in Alsace, in north-eastern France. 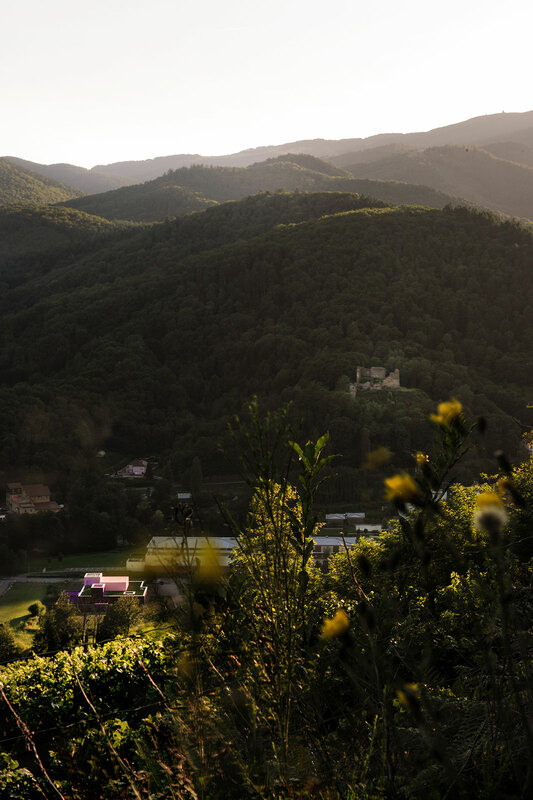 Completed in June 2015, the 763-square-meter edifice is a beautiful example of contemporary design that freely communicates with its rural surroundings as well as the 14th-century castle that dominates the site from a nearby hillside. Echoing the orthonormal geometry of this fortified castle, the nursery is arranged in multiple crowns that form a solid shape, which the designing team claim they used “because this geometry has the advantage of making it possible to organise a core, thereby avoiding linear organisation which creates corridors.” The crowns, that seem to have been stacked on top of one another, give depth to the project and function as safety shields, so the building protects the children like a castle. 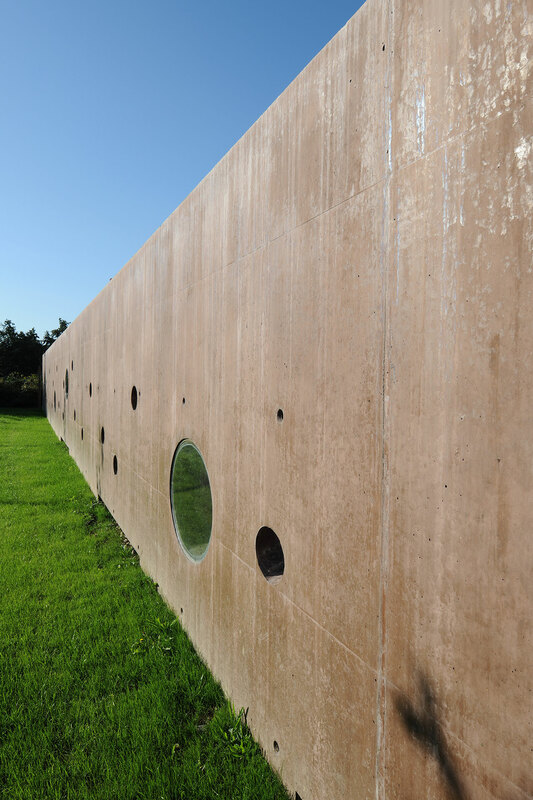 Taking the castle similitude one step further, a perimeter wall with round openings, resembling those in a fortress, safeguards the children’s playgrounds. 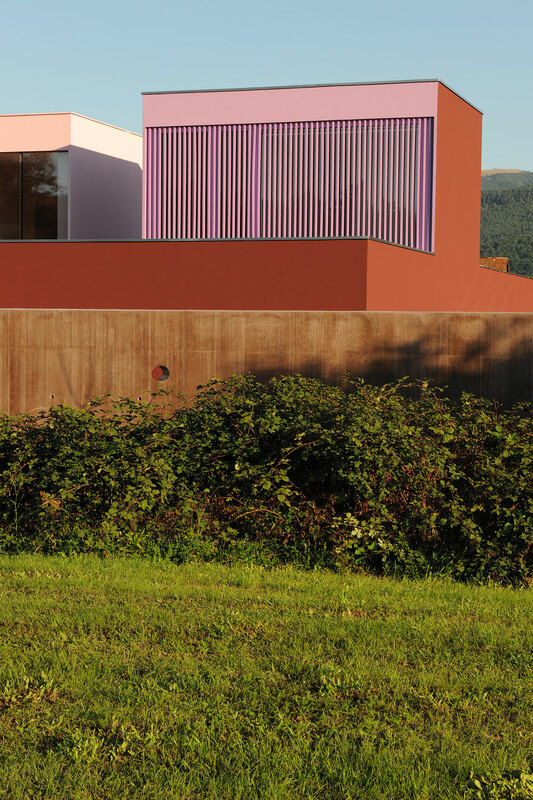 This spatial arrangement offers views of the rounded outlines of the Vosges Mountains, while also framing the landscape and drawing a clear limit between the building and the countryside, leaving the volumes of the nursery to emerge freely, offering an almost vernacular silhouette. 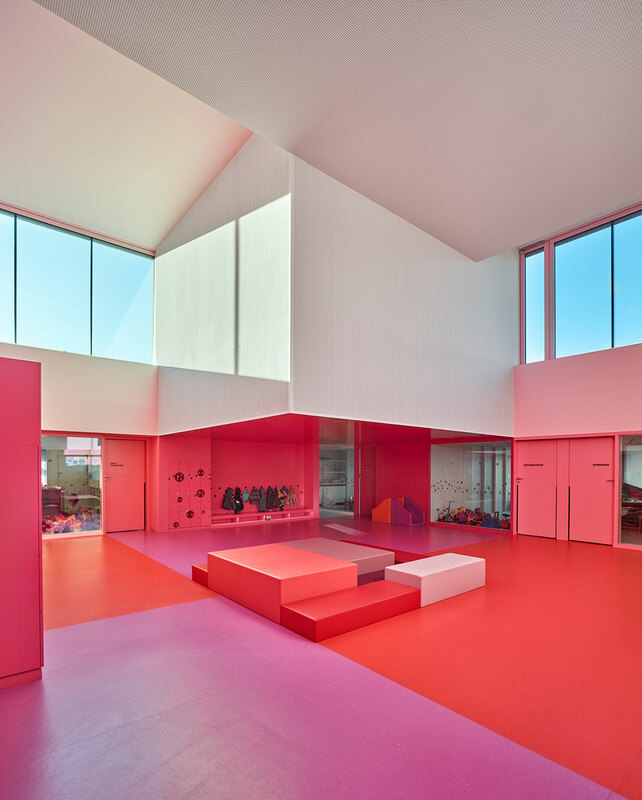 Venturing inwards, one sees that the heart of the building has been formed by a central space which emerges at double the height and plays with natural light, like a kaleidoscope, while the hall area is multifaceted, each face painted a different colour, ranging from pink to red. Comprised of matte and shiny-finished surfaces, this multiplicity of colours serves to both fragment the space as well as offer it a richer and subtler shape. 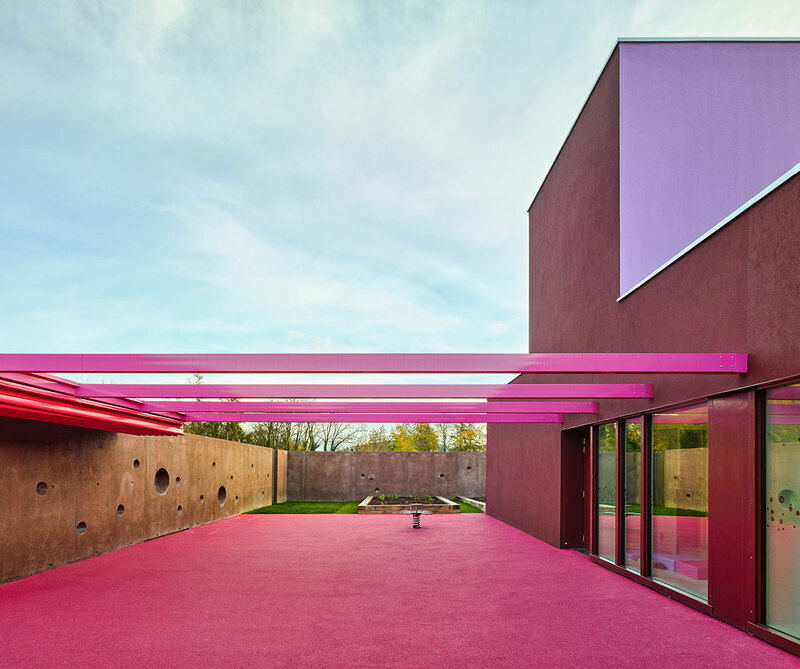 “Red and pink are not often used together”, says Dominique. 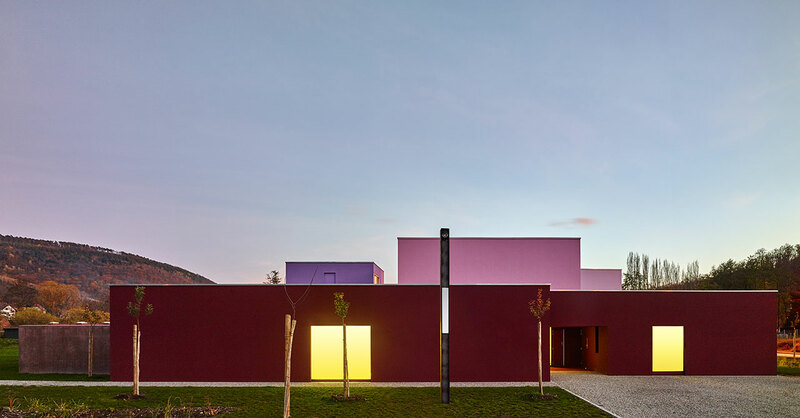 “But, what we were interested in with this project was to bring together and saturate warm colours. This palette, combined with natural light, produces a lovely glow”. 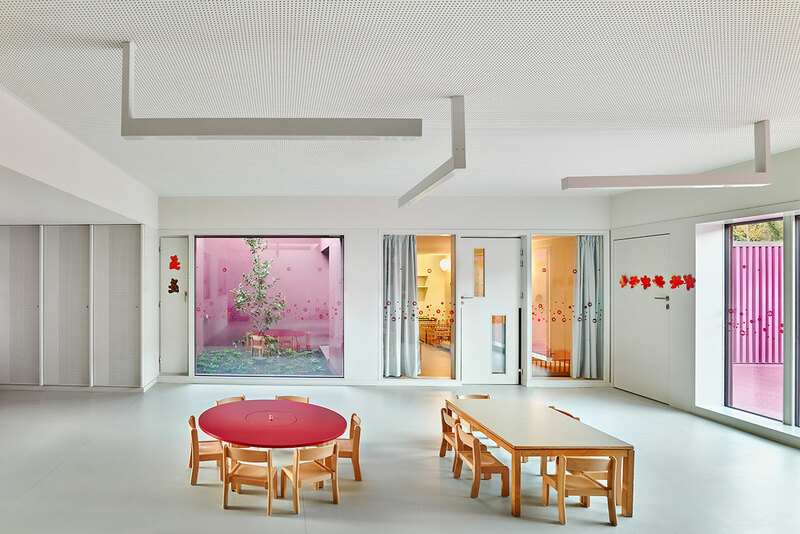 The nursery’s three activity areas and three sleeping rooms are all filled with the light, warmth and beautiful reflections of each space fusing into the next while the multiple transparencies installed between the different layers give the building incredible depth when looking from the inside out. 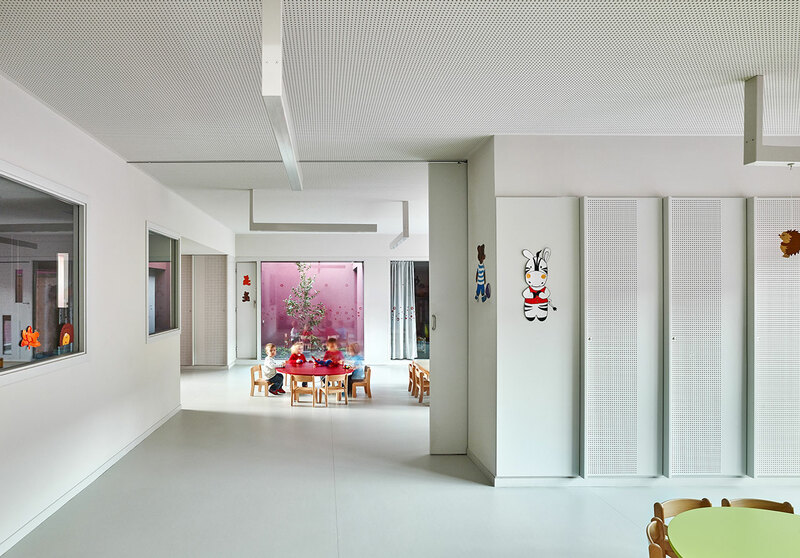 During the winter months, the children love playing under the abundant light flowing in from the big skylights emerging from the overall volume on the ground floor, over the hall. 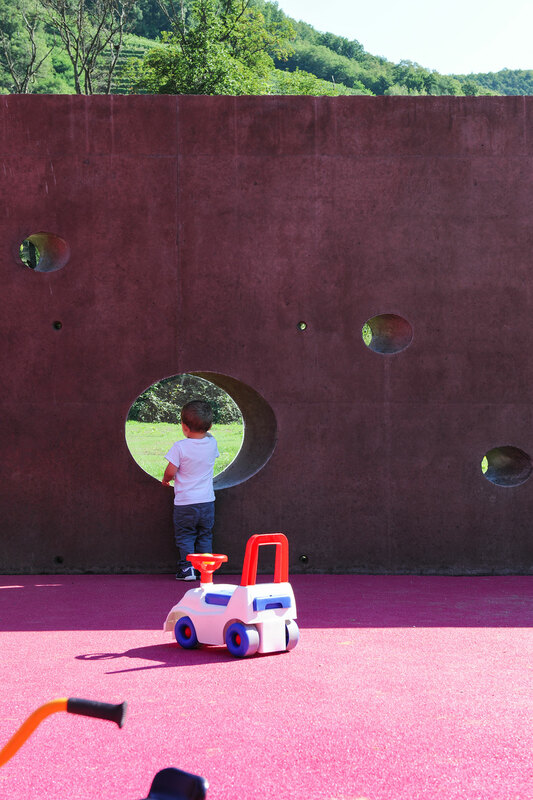 Come spring, the children venture outdoors to roam around the garden in the courtyard and look out of the holes in the walls at the sixty-eight apple trees that surround the building and connect it to the local agricultural landscape and the forests on the hills.